ABAJ, known for its LED TV’s is once again upbeat about the launch of its latest Smart TV, “55-inch LN 140 SMT FHD/SMART”. The smart TV promises to bring everything you watch to life and unmatched picture quality with A+ Grade panel. Movies, music, sports, games, online content, everything is optimized for an immersive experience. This Smart TV by ABAJ runs on Android 4.0 and above with pre-installed apps like Gmail, YouTube, Twitter, Facebook and Netflix. The 55-inch SMART LED TV offers sound clarity that matches the perfect picture quality. With a slim profile, the TV blends impeccably into your living space. The discreet, narrow bezel lays spotlight firmly on the picture, not the frame. Find out every detail in Full FHD with an extreme brilliance that brings real viewing experience with its picture processing, that upscales every pixel. The dynamic visuals with a display resolution of 1920 x 1080p, image freeze, sound output of 8W x 2, 178/178 (H/V) viewing angle are some of its defining characteristics. Integrated with the latest technology and features such as the user-friendly interface for easier adaption, 5 band equalizer, PC compatible endless internet supported with LAN Connectivity / Built-In WiFi makes this TV to emerge as a distinct face. 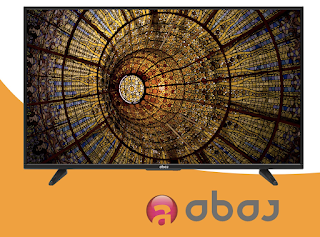 ABAJ 55-inch SMART LED TV is also powered by a Quad Core A7 850MHz with Dual Core MALI450MP2 400MHz GPU. Furthermore, the model comes with HDMI Inputs 3 (CEC/ARC/MHL), Headphone Jack, 2 USB ports. The model utilizes LINUX operating system and offers an option of Mouse Cursor on Remote. Consumers will also get the benefit of 3 years warranty and rapid service besides the high-quality parts used guarantees the long life of the product. Available at all ABAJ retail outlets, the 55-inch SMART LED TV is extremely pocket-friendly priced at Rs. 59,990. About Abaj Electronics: is one of the largest and highly competitive brands in digital electronics world. Innovation with technology on the leading edge and wide range of products brings totally a new dimension of entertainment with superior quality products. Abaj is always passionate about learning ultra modern and latest technologies that has resulted into the most innovative products in the digital world. Abaj products are a blend of world class technology, high performances and novel designs. Abaj makes available in India its wide range of consumer electronics, like LCD & Imperia LED, Air Conditioners and Sound Bars. Soon, the company will be adding product categories including Refrigerators and washing machines.